Midwifery services vary by province and territory. In some provinces, midwifery has been regulated and funded for over twenty years, and in other provinces and territories, it is not yet regulated or funded. 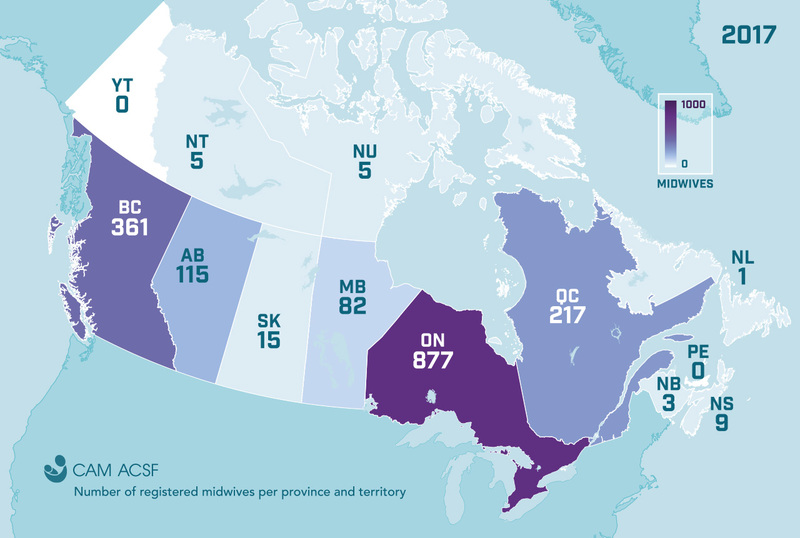 Please click on each province and territory to learn more about the status of midwifery services and to connect to the local midwifery associations. Data on total births from Statistics Canada for the period July 1, 2016 to June 30, 2017. Data on midwifery-led births and number of midwives is from the same time period if available, and if not, from as similar a time period as possible. The National Aboriginal Council of Midwives (NACM) exists to promote excellence in reproductive health care for Inuit, First Nations, and Metis women. We advocate for the restoration of midwifery education, the provision of midwifery services, and choice of birthplace for all Aboriginal communities, consistent with the U.N. Declaration on the Rights of Indigenous Peoples. As active members of the Canadian Association of Midwives, we represent the professional development and practice needs of Aboriginal midwives to the responsible health authorities in Canada and the global community. Over the previous year, NACM carefully developed a relationship based on mutual values with Save the Children Canada (SCC), an organization that prioritizes Indigenous maternal and child health. NACM signed a partnership agreement in May 2016 that includes funds granted to NACM to undertake some important activities. SCC and their corporate partner, Carters Osh Kosh, have raised funds in Carters stores over the last year, to support Indigenous maternal health. The partnership has allowed NACM to undertake two exciting initiatives in 2016: 1) a situational analysis to help NACM understand its strengths and how best use resources moving forward, and 2) publications on cultural knowledge to support indigenous families looking for cultural knowledge that will help them prepare for giving birth and caring for their babies. There has been an increase in privately funded, free‑standing birth centres in Alberta from 2 (one in Calgary and one in Edmonton) to 4 more in rural areas (Cardston, Cochrane, Lac La Biche and Rocky Mountain House). Over recent years, the Alberta Association of Midwives (AAM) has worked to increase midwifery funding and to strengthen itself organizationally. Since September 2015, the AAM has seen an additional $12.8 million in funding commitments over a three‑year period. This came after considerable engagement with government officials and the active involvement of consumers. To support this initiative, the AAM participated in an eight‑minute video, What is Midwifery, which was produced by the Association for Safe Alternatives in Childbirth. In April 2016, the AAM, Alberta Health (policy), Alberta Health Services (administrator), the College of Midwives of Alberta, Mount Royal University, and a consumer from an underserved community held a Sustainable Funding Model Summit. The five organizations (the “Quintet”) collaborated to develop principles for sustainable funding models and submitted a report to the Minister of Health. The Quintet continues to meet periodically to advance the sustainability of midwifery in Alberta. The AAM participated in HIROC’s Risk Assessment Checklist program over a three‑year period and received a value‑added benefit totaling approximately a quarter of a million dollars to better serve its members. These funds were used to hire staff dedicated to membership, insurance and continuing education activities. The funds were also used to design and build organizational infrastructure including an external website and a revamped member website and database that were launched in 2017. The value‑added benefit was also used to formalize systems for delivering continuing education, Emergency Skills instructor training and to purchase ESW equipment including two full birth obstetric trainers made from realistic flesh‑like material that creates a realistically tactile experience when simulating birth. Although recent years have seen great accomplishments, there is still work to be done to bring all midwives to capacity, support new registrants and bring services to more rural, remote, Indigenous and other underserved communities. This is while preparing to commence the next round of contract negotiations for a funding period commencing in April 2019 and as we navigate an election year. The Alberta Association of Midwives is excited about the future. Alberta midwives entered into a Memorandum of Understanding (MOU) for the time period commencing April 1, 2017 and ending March 31, 2019, which covers the last two years of a three‑year funding commitment of an additional $11 million announced by the Minister of Health in April 2016. As part of the MOU, the two organizations agreed to the design and implementation of New Registrants’ Program, the first participants of which started the program in the summer of 2018. All of this took place during a time of austerity that Alberta had not experienced for decades. Even though funding has been secured through March 2019, there is a continued need to negotiate with funders to ensure that midwifery grows in a sustainable way and that funding is allocated in a transparent and fair manner. In addition, future funding announcements need to include the provision of professional liability insurance for midwives who will provide additional services that are available through funding increases and administrative support in the Midwifery Administrative Office of Alberta Health Services which supports Alberta midwives within the health care system. Currently, the profession of midwifery falls under the Health Disciplines Act. The College of Midwives of Alberta is working towards moving under the Health Professions Act to become a truly self‑governing profession that no longer requires oversight by the Alberta Health Disciplines Board. In 2017 there were 290 practicing Registered Midwives in BC. Midwives are autonomous, self‑employed care givers currently attending 22.4% of the province’s births. BC is on target to achieve the goal set out by the Midwives Association of BC (MABC) in 2014 to have midwives involved in 35% of births by 2020. The MABC continues to exercise strong leadership in the promotion of the midwifery profession and in the protection of the vested interests of its members. The Board consists of three executive and a maximum of six general Board members including one student representative from the UBC Midwifery Program. 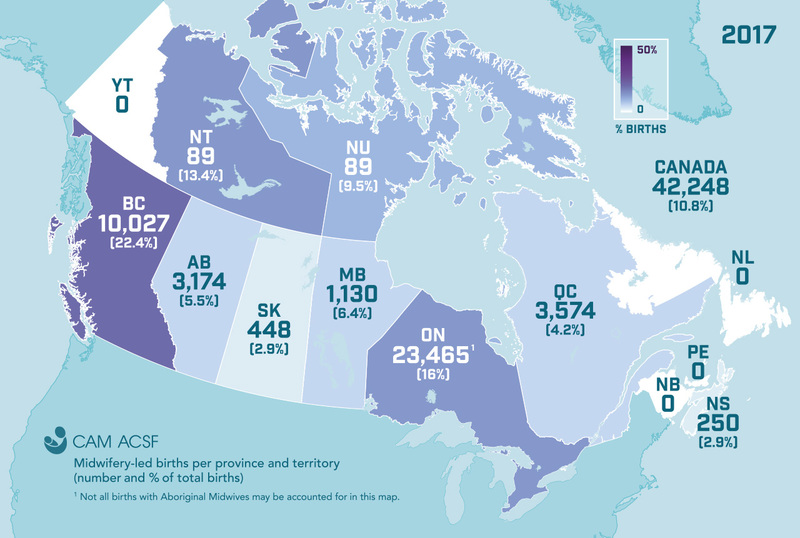 BC is leading the nation with 12% more midwife‑involved births than the national average. (Perinatal Services BC (May 2016) (Midwifery Report: Deliveries in BC 2015/16. Vancouver, BC). Victoria leads the way with over 36% of births having midwifery involvement. The MABC contracts NACM member Evelyn George, RM, to act as the MABC Indigenous Lead. A recipient of a First Nations Health Authority grant, Ms. George led a series of birth storytelling gatherings. MABC also contracts Ilene Bell, RM to act as the MABC’s Professional Practice Advisor (PPA). The responsibility of the PPA is to provide advocacy and assistance to practicing midwives experiencing barriers with professional integration.The MABC has created a list of midwives with MedavieBlue Cross billing numbers who are available to serve refugees, and has translated its new Midwifery FAQ brochure into 14 languages. Members are enjoying some of the benefits of MABC’s latest contract, including ordering home birth supplies and medications through the Homebirth Supplies and Medications program. They have also launched new fee codes for RMs providing Consultative Care and Assessment, Supervision of Conditional Registrants and for Surgical First Assist at a CesareanSection and Most Responsible Provider for Baby at a Caesarean Section. 2018 marks the 20‑year anniversary of regulated midwifery in BC and the association will be celebrating BC midwifery history in a number of ways, one of which is through an interactive digital timeline which will highlight the profession’s many milestones over the last two decades. After over a decade of urging government to amend legislation regarding midwifery practice, Manitoba midwives now have an expanded scope of practice. The expanded regulations allow midwives to provide more services to clients. For example, midwives may prescribe more medications, such as antibiotics for UTIs and mastitis, and order more lab work, such as blood work for clients with hypertension or thyroid issues. Manitoba has been trying to establish an education program since regulation in 2000. A program was started and funded through the University College of the North (UCN) in 2006. The program experienced many problems and setbacks but managed to graduate 10 students and recently did a second intake of 14 students who completed their first year of studies in 2015‑2016. Negotiations and plans were ongoing to establish a joint program between UCN and the University of Manitoba (UM). Manitoba midwives were hopeful a program created within the UM — which is established and recognized throughout Canada as a leader in inter‑professional education and collaboration — would better situate midwifery within the healthcare system. The education program faced a major setback in June 2016 when the newly elected Manitoba government chose not to fund the joint venture. Manitobans elected a Progressive Conservative government after nearly 17 years of NDP government. Despite the PC’s vocal and vociferous criticism of the NDP’s failure to establish a sustainable education program, their first action was to cancel a newly created joint midwifery program between UCN and UM. The MAM’s relationship with the new government got off to a rocky start. Midwives and Manitoba families made their voices heard. Letter after letter was sent to voice their outrage. The Midwives’ Association attended a question period at the Legislature and held demonstrations. The government did not fund the joint program, but there is a silver lining. Thanks to the hard work of a few key individuals, Manitoba’s 14 midwifery students will be able to graduate with midwifery degrees. They will continue their education in Manitoba, via the McMaster University MEP. Though there is still a lot of work to be done in establishing a sustainable midwifery program in Manitoba, the Manitoba Association of Midwives is looking forward to welcoming these students into their clinics, their practices and their profession. Future intake of students is still unresolved. Currently there are 7 registered midwives and 4 student midwife members of the Midwives Association of New Brunswick (MANB). NB Families for Midwives is our amazing and active consumer support group in the province. It advocates for the expansion of midwifery services. New Brunswick’s first 3 midwives were hired between May and November 2017. The midwives attended their first birth at the end of November 2017. The midwives moved into their permanent and stand-alone location, the Fredericton Midwifery Centre, in March 2018. The Midwifery Act was declared in 2010. The Department of Health announced in February 2016 that New Brunswick would soon have its first practice, comprised of four midwives, which it now has. Midwifery regulations in NL were passed in April 2016 and came into effect on September 30. The first meeting of the College of Midwives of NL (CMNL) took place in October 2016. Members of the Midwifery Implementation Committee have met with the two Health Boards recommended to begin the roll out of Midwives. The Association of Midwives of NL, with the assistance of the NL Council of Health Professionals, lobbied for some start up funds for the CMNL to cover expenses. The College received funding for two years and the NL Council of Health Professionals currently holds the liability insurance. The Association is now waiting to hear back about futurefunding and subsidization of liability insurance. The Department of Health and Community Services hired midwife Gisela Becker in September 2017 to lay the groundwork for establishing the first midwifery practice, which will be centrally located. The target date for opening the doors is September 2018. In NWT most midwifery clients give birth in Yellowknife, where currently there are no practicing midwives. This year, 39 of 89 midwifery clients gave birth in community with midwives. Two midwifery programs currently exist in NWT: one in Fort Smith and one in Hay River. No education programs exist in the NWT, but there have been approximately 3 to 4 midwifery students doing elective placements in the NWT each year. In 2015‑2016 there was a significant increase in active members of the Midwives Association of the NWT (MANWT) which meant that the association had its first AGM in several years and established a board of directors. There are now five active members on the board. The Department of Health recently started a review of the midwifery regulatory framework which was established in 2005. This review is being undertaken by an inter‑professional committee which includes midwives from the MANWT. To date the committee has reviewed and updated the Midwifery Practice Framework and implemented Standards of Practice for Registered Midwives in the NWT for Prescribing, Ordering, and Administering Drugs/Controlled Substances and Medical Supplies/Equipment, increasing the number of drugs that midwives may prescribe. Moving forward the committee will review the current Standards of Practice and Continuing Competency Program. It is expected that over the next few years the Midwifery Act will also be reviewed as midwives will be brought under the new Health and Social Services Professions Act. Twelve midwifery positions are currently funded in Nova Scotia: 3 in each of the rural sites of South Shore and Antigonish and 6 positions in the Halifax region. As the local professional body, the Association of Nova Scotia Midwives (ANSM) supports the growth, sustainability of midwifery in the province, region, country and beyond. The Nova Scotia Department of Health and Wellness has shown commitment to midwifery in the province. The ANSM hopes to see this support continue in the three health districts with midwifery, and to see expansion into regions that are currently without midwives. There are currently no midwifery education programs in Nova Scotia or in any of the Atlantic provinces. Atlantic‑based midwives have been preceptors for students within Canadian midwifery education programs. An external assessment was completed in 2011 with recommendations to support and expand midwifery in Nova Scotia. Shortly after that report, Nova Scotia underwent a lengthy change from regional health authorities to a single health authority, Nova Scotia Health Authority (NSHA). This meant that “new money/programming” was halted and midwifery growth became stagnant. Since that time, some of those recommendations have been implemented but the growth of funded positions has been slow. Recently, through the advocacy work of the ANSM, all three sites were given an additional full‑time position to add to the current complement. This is the start of what we hope to be a long‑term commitment to midwifery in the province. One of the recommendations in the report was to create a second attendant program in each site to support home birth. This was a lengthy process and has not been sustainable in one rural site due to staffing numbers, but, at the Halifax site, the home birth program is thriving. Home births are now offered at all three sites unless there is a staffing shortage due to vacation or unexpected time off. The ANSM continues to advocate for the growth of midwifery and at this time, government relations are very positive. Presently Nunavut has two active midwifery practices — one in Rankin inlet with 4 full‑time positions available, and one in Cambridge Bay with 3 full‑time positions available. Registered Midwives are salaried employees for the government of Nunavut. Midwives care for all high and low risk pregnancies and conduct carefully screened low risk births at the health centre. All post-partum women receive care from midwives for 6 to 8 weeks in their respective communities. Midwives also provide counseling for STI’s and well women care and may attend on Medevacs in emergency situations. Midwives also provide pre- and post‑natal care to women in outlying communities. A midwifery registration committee has been struck as the regulatory body for Nunavut midwives. There are currently 877 midwives in Ontario. Accessing hospital privileges and maintaining primary care in hospitals with clients who require induction, augmentation or epidurals continues to be a challenge in about 50% of hospitals where midwives hold privileges. Aboriginal Midwives provide care to Aboriginal communities in Ontario under an exemption in the Midwifery Act. The Association of Ontario Midwives (AOM) has added a membership category for Aboriginal Midwives and is working to improve access to midwifery care provided by Aboriginal midwives. The AOM has been advocating for funding to expand Aboriginal midwifery since 2011, and in 2017, six Indigenous practices opened: Dilico Family Health Team Clinic (Fort William); K’Tigaaning Midwives (Nipissing); Kenhte:ke Midwives (Tyendinaga); Onkwehon:we Midwives (Akwesasne); Shkagamik-Kwe Health Centre (Sudbury); and Southwest Ontario Aboriginal Health Access Centre (London). After adopting the restoration and renewal of Aboriginal midwifery as one of its four strategic goals in 2017, the AOM hired its first Director of Indigenous Midwifery. Ellen Blais started in that role in July 2017, and began hiring the rest of the department, which now numbers two other full‑time staff. In 2013, Ontario midwives brought an application to the Human Rights Tribunal of Ontario (HRTO) that alleges that midwives have experienced a gender‑penalty in their pay set by the government for almost two decades. More than 800 present and former midwives are applicants in this precedent‑setting case that will review more than 20 years of evidence. Hearings began in June 2016. In the fall of 2016, 11 midwife witnesses, including AOM President Elizabeth Brandeis and seven past‑presidents, took the stand to describe the history of discrimination and their efforts over the years to address the wage gap with the government and advocate for compensation that accurately reflects midwives’ skills, effort, responsibilities and working conditions. The hearings wrapped up in June 2017. As Ontario midwives wait for a decision from the HRTO, they continue to provide Ontario families with excellent midwifery care. There is still no midwifery legislation and no practicing midwives in Prince Edward Island. In May of 2016, a cost analysis commissioned by the union supporting the Regroupement Les Sages‑femmes du Quebec (RSFQ) was published by the firm MCE Conseils comparing the costs of births with midwives versus births with doctors. The report found that, in addition to lowering the number of interventions and providing health promotion benefits, midwifery also provides important cost savings for the health care system. The report notes that if midwives were responsible for 10% of births in Quebec, the province would save $2.9M a year in salaries alone. The results of this study will be useful in promoting the development of the midwifery profession in Québec. The RSFQ is working on developing services in the province as well as supporting groups of citizens who want access to midwifery services. Demand is high and many parent‑supported projects are gaining traction in different regions across Quebec. Six birth centres (maisons de naissances) are planned for Montreal before 2019. Multiple ‘points of service’ have been developed in conjunction with existing birth centres. Midwifery services will be available in Cree territory by the end of 2018. Midwifery services will soon be in the start‑up phase with the hiring of a midwife coordinator in Gaspésie as soon as possible. Many other new projects are on their way (Montérégie, Abitibi‑Témiscamingue). The RSFQ was in negotiations for a third Agreement since July 2015 when it finally concluded a new agreement in March 2018, which its membership voted to ratify on April 11. MSSS positioned itself in favor of the development of midwifery, and the RSFQ feels that the agreement reached reflects that as midwives have made some important gains with respect to working conditions that strive to recognize the value of the profession. Midwifery care is available in three Health Regions and one First Nations Hospital out of thirteen Health Regions in Saskatchewan. Demands for midwives far exceed supply throughout the province. Saskatchewan continues to work towards recruitment of midwives, offering education and training opportunities for midwives wanting to work in the province, and providing care to women outside of the urban settings. The government has been finding ways of expanding access to midwifery care in other parts of Saskatchewan. A workforce policy consultant to the Ministry of Health has been in position since the beginning of the 2013 to enhance recruitment and retention of midwives in Saskatchewan. No educational program is presently available in the province, but the number of student placements is increasing every year. The Midwives Association of Saskatchewan (MAS) is continuing to grow and transition. It has held a strong presence in union negotiations and has agreed on a new wage scale for new employees. It continues to negotiate regarding elements of the collective agreement. Water birth is being offered in all facilities where midwifery is available. Saskatoon is thriving with a high home birth rate and Regina is beginning to diversify the care it offers by expanding to provide primary health services to priority populations. Saskatchewan midwives continue to work with the transitional council and the provincial government to expand midwifery and to advocate for the need of an education program in the province. Midwifery remains an unrecognized profession in the Yukon territory. The Community Midwifery Association of Yukon (CMAY) was founded in January 2015. Since that time the membership has grown to 150 members and a Board of Directors comprised of 13 dedicated members, 3 of whom are midwives. Currently CMAY is represented on a Midwifery Advisory Committee, a stakeholder group under the Yukon Territorial Government. The Liberal Party was elected to government in 2016. The Premier’s mandate letters to both Community Services and Health and Social Services included the mandate to regulate and publicly fund midwifery. The Premier also promised to do so by the end of 2018 the speech to the throne. The Midwifery Advisory Committee is currently advising on the development of the regulation and the development of midwifery services in the territory. The Committee is comprised of representatives of the Community Midwifery Association, the Yukon Medical Association, Yukon Registered Nurses Association, Whitehorse General Hospital Corp, policy analysts and assistant deputy ministers from Yukon Territorial Government.